Over the past few months we have written about several waterproof MP3 players, though we have never really expected to see a product launch in the UK. 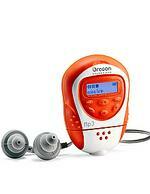 Well Oregon Scientific has obviously been listening to the silent pleas of TD's swimming-obsessed team for it has lined up a September launch the £100 Oregon Scientific MP120 waterproof MP3 player. The small flash-memory based device has 128MB of storage - enough for a couple of hours of Beach Boys tunes - and, apparently, you can even take it surfing. Came straight to this page? Visit www.TechDigest.tv for all the latest news. "Oi, where d'you think you're going?" Do You Want Chips with that?